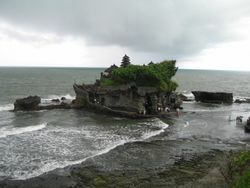 Tanah Lot is a coastal temple in South Bali. A taxi from Kuta will be quoted at Rp 300,000. It's possible to haggle down to a minimum of Rp 100,000 if you stand firm. 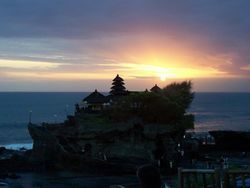 A visit to Tanah Lot for sunset is one of the most popular organised tours offered in Bali. Check at your hotel. Entry to Tanah Lot is Rp 60,000 for adults and Rp 30,000 for Children. Due to the presence of GoJek, Grab and Uber, hailing down cheap transport in Bali is abundant. It's important to note however, that if you decide to travel to famous sites or certain places of interest, these drivers are permitted to drop off people to the site as a destination, however are prohibited to pick up when a booking is made through any of the above applications. This is due to a "community" where-in the larger and original taxi companies stick together and ward off any app-based drivers. This means that the original taxi companies can make a huge profit, however this won't take into consideration your bargaining skills. Expect them to give a starting price of Rp 250,000. Once you arrive at Tanah Lot, park your vehicle in the official car park (Rp 5,000) and proceed on foot. Tanah Lot is one of the important directional temples in Bali. The temple is located on a rock just offshore. It is said to be the work of revered 15th century Hindu priest Nirartha and forms an important element of Balinese spirtualism and mythology. This is an extremely popular tourist destination and the whole area is often very busy indeed, especially in the late afternoons, pre-sunset. The area between the car park (Rp 5,000 per vehicle) and the beach adjacent to the temple is a maze of souvenir shops selling just about every Balinese trinket imaginable. Once you have fought your way through the souvenir vendors to the beach, you will see the magnificent temple perched on a rock just a few metres offshore. There is a footpath to the raised cliff area just to the south from where the views of the temple and the sunset behind it are outstanding. Photo-opportunities abound. At low tide visitors can walk to to the base of Tanah Lot. For a small donation you can be blessed and can then walk some 20 metres around the side on a path, that eventually leads up to the temple. You have no better view of than from that on the sand. The only advantage being that you are standing on the base of Tanah Lot itself. Restoration of the Temple. A comprehensive restoration programme started in the 1990s when it was realised that the rock was seriously eroded and in danger of collapse. This major work resulted in the actual temple being out of bounds which is still the case as of February 2013. This is not really a hindrance to visitors though as entrance to the actual temple is not the key attraction. The superb Nirwana Golf Course  is adjacent to Tanah Lot, just to the south. This Greg Norman designed course is consistently voted as one of the very best in the whole of Asia. Stunning cliff top setting. Packages are normally available (ask at your hotel). Expect to pay US$ 170 to 200 per round all in. The approach path to Tanah Lot temple is a maze of souvenir shops and not a bad place to fill up your bags with trinkets if you are so inclined. Virtually all of the restaurants at Tanah Lot serve Es Kelapa Muda (chilled young coconut). This is a lovely refreshing option while watching the sun go down at Tanah Lot. Not only that, you also can buy the traditional food, like lawar (kind of vegetable), some cold drink, etc. Be aware that from Tanah Lot there aren't many options for transportation, as most people visiting the area will leave the same day with their respective tours. Therefore any taxi or motorbike will be able to command a high rate. Taxis may have a set price list and not stray from what is listed. Tanah Lot to Ubud cost Rp 275,000 and took 1 hour & 15 minutes. Cheaper rates to Denpasar and Kuta. This page was last edited on 11 April 2019, at 15:03.